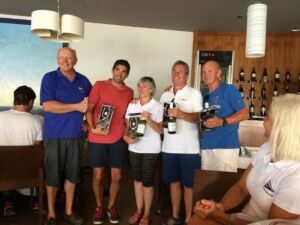 After what felt like weeks of not having free access to my computer, all Hugh’s hard work – aided and abetted by Rachel Garnham, Edo Volker and Richard Jones – came to fruition on 1st July 2015 when the fourth annual CBYA Regatta took place at the Real Club Náutico de Calpe. Rachel gave a detailed briefing of the fun exercises and subsequent two races, with Pablo adding a few words, before we headed out to rig up the six TOMs. The skippers, in numerical boat order, were Rachel, Hugh, Edo, Karlheinz, Jenny and Roger [latter being a Calpe member] although Russian Rosti took the helm, and there was a total of 25 crew, mostly four per yacht, with 41 people attending in total. First unscheduled fun was Edo getting mooring lines tangled as he rushed to leave the mooring, so Hugh couldn’t leave the pontoon either and they were both towed out by a RCNC rib. Two moored cruisers – Blade and Tricky D – had deployed stern marks near which each TOM in turn had to do four timed tasks. The first was a 720 degree turn which was fairly straightforward. The second was ‘heave to’: not so easy in the windy conditions. The next was two gybes, tack, gybe and tack, during which one yacht interfered with one of Hugh’s gybes, to get back to the mark, and finally a man overboard procedure. The man overboard was the Tricky D stern mark and the skippers provided much entertainment to the crew on board as each yacht tried to pick up, or at least touch, the buoy. Graham on Roger’s yacht misjudged his reach and was the first to cool off in the sea. Edo was next to line up but Tony, being slightly vertically challenged, just missed it. Bit of muttering from the Dutch contingent, but round they went again and this time Tony really stretched out, touched it – and promptly fell in! I should perhaps mention that we experienced 20+ knot winds, which did make sailing conditions a little difficult, and all but one TOM had reefed mainsails. The wind strength and direction also changed during the day. I ended up being ‘ballast’ in the bow, rolling – or being rolled – from side to side under the jib, and have the bruises to prove it. I am not supposed to lift/pull with one arm, so handling the jib sheets was too difficult for me this time without a winch handle. Pablo had meanwhile set the race course and after two crew switched with someone on each cruiser, the TOMs lined up and set off; a double windward-leeward course, with spinnakers banned as too windy. After the first leg, Jenny’s TOM had a problem with the mainsail which started to come out of the mast track forcing her to sail with an unpleasantly low boom which undoubtedly affected her overall scores. One of the spectators watched with interest as the yachts ran down to the leeward mark, some with goose wing sails, others preferring to gybe more frequently. After the two races and freshening wind, we all headed back to harbour, for a well-earned drink, followed by lunch. Edo [TOMs’ Co-ordinator], thanked everyone for participating before Rachel announced the scores: in 6th place Karlheinz/Gordon, 5th Edo, 4th Jenny, with only one mark separating them from Hugh in 3rd position; Gordon/Rosti was/were 2nd, leaving Hugh, as Vice Chairman, to present Rachel with her prize for 1st position. Well done everyone, another fun day. We are formeren neighbours of edo and marianne volker and this week in Calpe and would like to get in contact with edo and marianne. Could pas on this mail to edo or marianne?